2:2 And straightway: Most ancient manuscripts do not include “straightway” (Greek: euthys) here. A double negative in the Greek emphasizes that there was not enough room for everyone who wanted to be near Jesus. This phrase implies that even outside of the house (KJV: “about the door”) there was not enough space. Because the phrase “about the door” was used in 1:33, where there was room outside the door (even for the entire city of ten thousand people! ), this verse suggests a magnification of Jesus’ popularity. and he preached the word unto them: In early Christianity, “the word” (Greek: logos) was a technical term for the basic message about Jesus Christ. This reference to “the word” links to the story of the healing of the leper (1:45), where the leper (or Jesus—see the Notes on 1:45) preached “the word” (KJV: “the story”). Mark is about to narrate a healing story, but this reference to preaching keeps the preaching and healing aspects of Jesus’ ministry woven together. 2:3 And they come unto him: “They” may refer to the four people carrying the man, or it could refer to other people who accompanied them. bringing one sick of the palsy: The word “palsy” (Greek: paralytikos) indicates that the man could not walk but is no more specific than that. He might have had a stroke, broken legs that were not properly set, arthritis, or a head injury. However, it is unlikely that he was a paraplegic or a quadriplegic because these conditions were fatal before modern medical care. which was borne of four: That he had to be carried emphasizes his incapacity. and when they had broken it up: The roof was most likely made of wooden beams covered with mud and branches, leading some translations to say, accurately, that they were “digging through” the roof. One wonders what the owner of the house thought as his roof was destroyed and whether Jesus continued teaching as bits of mud and wood fell on him. they let down the bed wherein the sick of the palsy lay: “Bed” (Greek: krabbatos) might be translated as “mat” or “pallet”; it refers to the kind of bed that a poor person would have used. The friends who bring the paralytic are the opposite of the wicked person in the psalm: instead of digging a pit in wickedness and falling into it themselves, they “dig” a pit (in the roof ) to save a friend. The paralytic is like the wicked man (see the Notes on 2:5 on the link between sickness and sin) from the psalm, but the faith of his friends and Jesus’ intervention changes the pit (in the roof ) from a further source of injury to something that saves him. 2:5 When Jesus saw their faith: Faith is not normally thought of as something one can physically see; what Jesus actually saw were clumps of dirt falling. The friends do not say a word in Mark’s account, but their faith is nonetheless evident, and Jesus chose to see the faith that motivated their actions. The people who came with the paralyzed man. The four people who carried him. Perhaps Mark is making a point about the importance of community: the paralyzed man would not have been able to enter Jesus’ presence without the help of his friends. The word “faith,” which occurs only four other times in Mark’s Gospel (4:40; 5:34; 10:52; 11:22), is related to “actions taken to receive Jesus’ help” and not, as the word is often used in modern English, to mean agreement with certain theological beliefs, hence the New Rendition’s translation of “trust.” And because the Greek word for “faith” (Greek: pistis) is very similar to the verb “believe” (Greek: pisteuō) that was used to describe Jesus’ ministry in 1:15, Mark’s audience likely would have made a connection between Jesus’ call for people to believe/trust him and the action that Jesus sees in this verse. Contrary to what was expected in healing stories in the Greek world, this story shows faith before the miracle and not as a result of the healing. It was an uncommon method of address, and so Jesus’ use of it here is a profound statement of his “adoption” of this poor, ill man. It was regularly used by teachers when addressing pupils, which means that Jesus is treating this man as if he were a disciple. thy sins be forgiven thee: There is a textual variant here: some texts read “are forgiven” (in this moment) while others read “have been forgiven” (in the past). If the sins are being forgiven as Jesus speaks, it is more likely that his words are causing the forgiveness to happen, much as his words cause the healing to happen. Soon, Jesus will know the unexpressed thoughts of the scribes (2:8); perhaps he also knows what is in the crippled man’s mind, and so he mentions forgiveness because the condition was due to sin. It is even possible that the man has experienced somatization (the manifestation of physical ailments based on psychological causes) related to some sin he had committed, and his lameness is the result of his sinful state. The contrast with other healings—where no reference to sin is made—suggests that some illnesses are a result of sin but others are not. Perhaps the man thought (incorrectly) that his condition was due to sin, so Jesus forgave him to reassure him. Jesus forgives the sins primarily as a “teaching moment” for the scribes; the man is no more or less guilty of sin than any other person. Jesus is announcing that God has forgiven the man’s sins, as suggested by the passive voice: this is an example of the divine passive, used when God is the subject of the verb. In support of this reading is the possibility that the phrase “on earth” (2:10) implies that Jesus is just announcing on earth something that was already a reality in heaven. The problem with this reading is that it is difficult to understand why the scribes object if Jesus was only announcing that God had forgiven the man’s sins, since there is precedent for a prophet proclaiming that God had forgiven sins (2 Sam. 12:13). (If they had thought Jesus was announcing forgiveness that God had granted, they might have accused him of presuming to be a prophet but not of blasphemy.) While it has been suggested that the scribes thought Jesus was forgiving sins but Jesus meant that God was forgiving the sins, this reading seems unlikely because one presumes that Jesus would have corrected their mistaken impression, particularly since the story emphasizes his ability to understand their thoughts (see also the Notes on 2:10). Jesus himself is forgiving the man’s sins. The reference to the Son of Man in 2:10 supports this reading, as does Jesus’ statement that he will heal the man in order to show the Son of Man’s authority to forgive sins. Given the problems with #1 above, this seems to be the better reading. The power and authority to forgive sin is quite a claim, as the internal thoughts of the scribes make clear, because it means that Jesus is exercising a right that only God has. This is a significant moment for Jesus’ ministry since performing exorcisms, enacting healings, touching lepers, and calling disciples might have been unexpected, but they would not have been regarded as blasphemy. Perhaps Jesus’ statement was ambiguous as to who was actually forgiving the sins. 2:6 But there were certain of the scribes sitting there: The “but” at the beginning of this verse positions the scribes as antagonistic to Jesus, and their sitting contrasts with the physical activity of the four friends who showed faith. and reasoning in their hearts: The verb here (Greek: dialogizomai) “is almost always used in a negative sense in the NT.” In the biblical world, the heart is a metaphor for what now would be called the mind. (Moderns consider the heart the seat of emotions, but in the NT the bowels were, so the scribes are thinking about what has happened; there is no implication that they are being emotional.) They are not speaking out loud. It is tempting to accuse the scribes of having more concern with being correct than with being merciful, but it is also true that blasphemy was a serious crime that they felt obligated to address. 2:7 Why doth this man thus speak: The wording “this man” is probably filled with contempt. It is ironic that while Jesus is in the very act of forgiving sins and healing infirmities, they refer to him in this rude manner. blasphemies? : Here, “blasphemies” can be translated as an adverb (“he speaks blasphemously”) or as a verb (“he speaks . . . he blasphemes”). It could be punctuated as a question (“Does he speak blasphemously?” or “Is he blaspheming?”) but one with a very hostile edge. The blasphemy here would not be speaking ill of God but rather assuming a privilege (in this case, forgiving sins) that is limited to God alone. Under the law of Moses, blasphemy merited a death sentence (Lev. 24:16), so there may be a bit of foreshadowing here since that charge will ultimately be leveled against Jesus (14:64). who can forgive sins but God only? : The phrasing here suggests that they are alluding to Deuteronomy 6:4 (commonly known as the Shema), with its reference to God being “one” (KJV: “only”). The idea that God— and only God—could forgive sins is well-established in the HB (Ex. 34:6–7; 1 Kgs. 8:39; Isa. 43:25; 44:3). 2:8 And immediately when Jesus: The word “immediately” probably indicates that Jesus used a miraculous capacity to understand what they were thinking; he didn’t need time to, for example, ponder their body language. Mark underplays the fact that a miracle happens here as Jesus is able to read their thoughts. (But some scholars think this phrase reflects common discernment and no miracle.) In the HB, God (and only God) can know what is in people’s hearts (1 Kgs. 8:39), so this phrase identifies Jesus with the God of the HB. It is ironic that at the very same moment when the scribes are questioning Jesus’ authority, he is exercising miraculous powers to understand their thoughts. perceived in his spirit that they so reasoned within themselves: This does not seem to be a reference to the Holy Spirit but rather to Jesus’ own spirit. There may be a contrast between Jesus’ spirit and the hearts (minds) of the scribes. he said unto them, Why reason ye these things in your hearts? : By responding to a question with a question, Jesus was using a common rabbinic teaching style, which encouraged reflection and pondering among Jesus’ audience as well as Mark’s. It required work on their part and a willingness to learn. They were reasoning about these things. The situation called for something other than reason (perhaps faith?). They were reasoning within themselves (instead of asking Jesus a question). The objection is that they are not being open about their questions or seeking information from the person who could address their concerns but limiting themselves to what they already know. They were reasoning about these things in their hearts. Perhaps there is an opposition between heart (mind) and spirit, especially since the previous phrase showed Jesus gaining knowledge by perceiving in his spirit. On the one hand, healing is easier than forgiving sins: prophets (and others) can heal, but only God can forgive sins. On the other hand, saying that one could forgive sins would have been easier than healing because it would have been simple to verify whether someone had been healed, but there is no way to (dis)prove that sins had been forgiven. Because Jesus heals the man in order to demonstrate his authority to forgive sins, this meaning is more likely. If the proper backdrop to this story is a belief in the link between sin and illness (see the Notes on 2:5), then the answer to the question is that the two cannot be separated. The next verse will offer one solution to this conundrum: Jesus will do both, and so there will be no doubts about his authority. Relationship to Psalm 103. In Psalm 103:3, the very structure of the verse parallels forgiving sins with healing. Because the psalmist was speaking to the Lord, the allusion between that text and Mark associates Jesus with the God of the HB. 2:10 But that ye may know: Normally in Mark, an explanatory clause like this would come after the main clause, but here it is placed at the beginning of the sentence in order to emphasize that what is most at stake is the issue of Jesus’ authority. “Know” may contrast with the reasoning of the scribes and imply a difference between reasoning and knowing. Jesus implies that his audience can know something because of what they see—they will see a healing, and that will illustrate that Jesus has authority to forgive sins. Perhaps this phrase echoes Jesus’ seeing their faith when they brought the lame man to him: the people will know what is true based on what they see, just as Jesus knew they had faith based on what he could see. Relationship to Exodus 7–10. When Moses appeared before Pharaoh, he spoke of what Pharaoh should know—namely, who the Lord is and what his powers are (Ex. 7:17; 8:10, 22; 9:14; 10:2). That is, the plagues were not ultimately about frogs or punishment but rather about the identity and power of the Lord. This makes a compelling parallel to this healing in Mark because it suggests that this text is not primarily about forgiveness or healing but rather about Jesus’ identity—what his audience should know is who the Lord is and what his powers are. The allusion would also imply that Jesus, like Moses, is a spiritual figure in front of earthly authorities and that he will use his miraculous powers to give the leaders an opportunity to repent. But the parallel also suggests that, like Pharaoh, they will not accept this offer and will suffer the consequences. So the allusion turns the scribes into the functional equivalent of Pharaoh—a stinging indictment of those who should be religious leaders. One distinction between the stories is significant: instead of the destructive signs that Moses performed, Jesus’ sign is a positive, healing one. This implies the superiority of Jesus over Moses. The qualifier “on earth” could imply one person granting forgiveness for another person’s sins in the earthly sphere; heavenly or eternal forgiveness would still be God’s prerogative. Matthew 9:8 implies that Matthew understood the story to mean that more than one person on earth (hence “men,” which is plural) had authority to forgive sins. hath power: “Power” can be translated as “authority.” (English makes a distinction between power [the ability to do something] and authority [the right to do something], but Greek does not in this case.) Significantly, “there is no evidence in other Jewish literature that any man, whether prophet, priest, king, or Messiah, had such authority to forgive sins.” So this would have been one way in which Jesus would have violated expectations. “Sins.” So the Son of Man has authority to forgive sins that are committed on earth. This implies the possibility of sinning after (and before?) this life; it would be interesting to speculate as to why the Son of Man did not (at this time) have authority to forgive those sins. The forgiveness that the Son of Man extends applies on earth only. (This implies a different forgiveness on earth than in heaven.) If the idea is that God has delegated some power to Jesus to exercise on earth only, there might be some interesting implications here for Latter-day Saint thought regarding authority and delegation of authority. Jesus’ authority to forgive sins covers the entire earth and is not limited to the house of Israel. Jesus’ ability to forgive sins is not tied to the sacrificial rituals performed in the temple but extends throughout the entire earth. “The Son of Man.” This would imply that the Son of Man, while on earth, can forgive sins. Perhaps this just means that he can offer forgiveness because he is physically present. Or it might mean that, contrary to the past (when authority to forgive sins resided only in heaven), that authority is now on earth with Jesus. In some manuscripts, the phrase is omitted, implying that the Son of Man’s authority to forgive sins is not limited to earth. Regardless of which option is chosen, the scribes had thought that only God (who is in heaven) could forgive sins, but Jesus’ statement declares that God’s power now functions on earth in new ways. This authority may be the result of the baptismal vision, where Jesus saw the heavens ripped open and the Spirit descending, symbolically representing the commissioning of Jesus to forgive sins. The reference to the earth might also link this statement to Daniel 7 (which is likely already in the audience’s minds due to the reference to the Son of Man), since in that text the Son of Man is given power to rule the nations on earth and since that power comes from heaven. Ironically, Jesus actually does answer the scribes’ question: they asked who had authority to forgive sins and Jesus says that the Son of Man does. to forgive sins: Unlike the reference to forgiving sins in 2:5, this reference is not passive. So it should be obvious by this point (even if it was not before) that the issue is not Jesus’ ability to announce that God has forgiven sins, but rather Jesus’ own practice of forgiving sins. Notice that Jesus (or Mark) does not actually finish this sentence; at least, not with words. This is a rhetorically clever move that Mark has preserved: the way that they know that Jesus has authority to forgive sins is not that he reasons them into believing it but rather that he acts in a way that demonstrates that it is true. The “Son of Man” reference seems misplaced since all other references to the Son of Man are in the second half of Mark’s Gospel. It makes sense of the rather direct statement about Jesus’ authority, which is atypical for his ministry and so perhaps more likely to be Mark’s statement. Direct address to the audience adds an immediacy to the text that draws them into the story. The aside also explains that this was not just another healing miracle but rather proof that Jesus can forgive sins. Relationship to Daniel 7. The reference to the Son of Man likely alludes to Daniel 7. In that text, the Son of Man is pictured as judging sin, so when Jesus says that the Son of Man has the authority to forgive sins, he’s identifying with the Son of Man but also inverting the audience’s expectations for what the Son of Man will do. 2:11 I say unto thee, Arise: Because this is the word (Greek: egeirō) that will be used for Jesus’ rising from the dead (14:28), there may be a bit of foreshadowing of the Resurrection here. and take up thy bed: The verb for “take up” (Greek: airō) is the same one used when the man was being carried (2:3, where it was passive). There is a moving irony here since he is carrying what used to carry him; as Peter Chrysologus, a fifth-century Christian bishop, described it, “Take up your bed. Carry the very mat that once carried you. Change places, so that what was the proof of your sickness may now give testimony to your soundness. and go thy way into thine house: As is often the case, Jesus performs a healing by commanding the person to do something that presumes that she has been healed. So the healing requires a display of faith on the part of the person healed—they must act as if the healing has already occurred in order for the healing to happen. 2:12 And immediately: “Immediately” emphasizes the fact that Jesus’ command is instantly followed. he arose, took up the bed, and went forth: This language is very similar to the previous verse, implying that Jesus’ words are instantly and completely enacted; this highlights his authority. before them all: Notice that the parallelism with the previous verse is broken here by the reference to “before them all” instead of “home.” This departure emphasizes that the audience witnesses what has happened and therefore should now understand that Jesus has authority to forgive sins. It is not literal but rather an example of Mark’s hyperbole; the scribes were neither amazed nor glorified God. The “all” is taken at face value, meaning that it would include the questioning scribes as well as the crowd, the paralytic, and his friends. This would emphasize Jesus’ healing and forgiving power. It is possible that some scribes became followers of Jesus; it is also possible that they were amazed at the miracle but failed to apply the larger message of the healing as evidence of Jesus’ ability to forgive sins. and glorified God: They did not glorify Jesus. This illustrates that Jesus’ words were not blasphemous; Jesus’ ministry does not harm God’s name but increases its glorification. The “it” refers to forgiveness of sins, which they believe that they have witnessed because they accept Jesus’ statement that healing illustrates power to forgive sins. If this structure was deliberate, it suggests an interesting parallel between physical and spiritual healing, as well as the idea that spiritual healing should precede (or must precede) physical healing. And the central point of the story is neither the controversy per se nor Jesus’ ability to heal but rather his authority to forgive, which is the center point of the structure. Relationship to Isaiah. In Isaiah 35:4–6, there is a prophecy of a future time when “the lame shall leap like a deer” (NRSV). This story in Mark may be a fulfillment of that prophecy as the man takes up his bed and walks. In Isaiah 64:4, the speaker expresses amazement at acts that have never been seen before, perhaps making a link to the similar exclamation in the present text. In Isaiah, it is God who is performing the new acts, suggesting a link between Jesus and the God of the HB. There has only been one previous reference to the scribes in Mark’s Gospel: in 1:22, the people marvel that Jesus’ authority makes his teaching very different from the scribes’. So it is perhaps not surprising that in this story, the scribes are also concerned with Jesus’ authority and whether he is exercising a power—to forgive sins—to which he is not entitled. 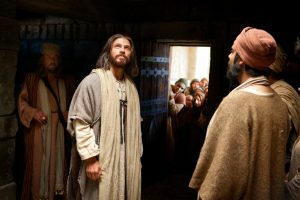 While modern Latter-day Saint notions of priesthood are not overtly explored in Mark’s Gospel, it is nonetheless true that proper authority is a major concern, and the issue of Jesus’ authority is raised again and again. The idea that specific authority is required to perform certain acts has already been affirmed at the baptism (where Jesus sought out John), in Jesus’ teachings in the synagogue (which were, unlike the scribes, “with authority”), and in Jesus’ authority to forgive sins. It is worth mentioning the obvious: the point of this story is that Jesus has authority to forgive sins. Prophecies about the Messiah do not state that the Messiah will forgive sins, so for Jesus to announce that the man’s sins were forgiven is to challenge the prevailing expectations for what the Messiah would be and to claim a power that was regarded as belonging to God alone. This is a profound statement about Jesus’ identity. The audience learns something else about Jesus as well, something about his character. Jesus could have chosen to focus on the fact that the roof was destroyed and his preaching was interrupted by falling debris, not to mention the spectacle of a man being lowered to him. But instead of “seeing” the disruption, Jesus chose to “see” their faith. There is a lesson here about what he chose to focus on. The actions of the lame man’s friends are technically unnecessary. Because Jesus can heal from a distance, there was no need to destroy the roof or to disturb the sermon to bring the man into Jesus’ presence. (In fact, their actions show a lack of faith since they do not understand that Jesus can heal from a distance.) They even could have waited outside until Jesus left the house—presumably he wasn’t going to stay inside forever. But Jesus does not focus on their shortcomings; he focuses on their faith. Jesus is accused of blasphemy, but there is another objection that could have been raised to Jesus’ actions: under the law of Moses, it is only the priest who can perform the atoning ritual by which sins are forgiven (Lev. 4:26), and “although there is no explicit statement that such atonement rituals were accompanied by the priest’s declarations of divine forgiveness, it can be assumed that they were.” By offering forgiveness in this story, Jesus implicitly teaches that forgiveness can be granted outside of those sacrificial rituals. While the issue is not directly addressed in the story, there is an undercurrent of Atonement theology here, since faith makes forgiveness possible through Jesus. This story contains several intriguing observations about seeing and knowing. For example, Jesus is able to see the faith of the friends who carry the man, although faith is not something one can normally see. Jesus is able to perceive the thoughts of his opponents, which is also atypical. And Jesus expects his audience to see a miracle and thus conclude that he can forgive sins. In effect, the healing becomes a sign of Jesus’ ability to forgive, just as the carrying of the man was a sign of their faith. Thus the story implies that seeing can transcend normal bounds and that knowledge can come from seeing. The four people who bring the paralyzed man to Jesus can be contrasted with the scribes, especially in terms of faith and (in)action. Given that whether it is easier to do or to say is a theme in this story, the contrast between the friends who do something and the scribes who just think is compelling. The friends are willing to destroy a roof and risk the wrath of the homeowner; they are willing to take risks in order to see their friend enter Jesus’ presence and have access to his power. The scribes, in contrast, neither do nor say anything. Neither the friends nor the scribes speak: the friends act, and the scribes reason in their hearts. The contrast in the characterization of the two groups leads to the conclusion that action, loyalty, community, and faith are needed to achieve forgiveness of sins. This story also contains a subtle commentary on the relationship between words and deeds. Not only does Jesus ask whether it is easier to do something or to say something, but Jesus apparently breaks off in midsentence in order to do something. This is a brilliant move on the literary level: it implies that words are not capable of conveying information as well as deeds are, which was also the case earlier in the story when Jesus saw—not heard—the friends’ faith. Since Jesus interweaves healing and forgiveness in this story, sickness can be understood as an analogy for sin. Just as illness had paralyzed this man, making it impossible for him to perform even the most basic tasks for himself, sin is similar: it makes it impossible to function and requires an intermediary to overcome its effects. The story conceives of sin, like illness, as a limiting condition. Just as Jesus’ healing is to be a sign of his ability to forgive sins, perhaps the illness is a sign of a sinful state. Repentance and resumption of normal life are pictured as rising and taking up one’s bed; the forgiven sinner is just as different from the sinner as a paralytic is from a man walking and carrying his bed. It is likely that there were people in Mark’s audience with horrible illnesses and no hope for recovery, as was the case for many in the ancient world. This story would have provided them with two types of hope: first, that the power that Jesus held could heal their condition and, second, that Jesus could forgive sins. While they might not have expected physical healing in their lifetimes, they could have developed faith that their sins could be forgiven. In this story, the association between Jesus and God is strong since Jesus is aware of unspoken thoughts, an ability shown only by God in the HB (1 Sam. 16:7; 1 Kgs. 8:39; Ps. 7:9; Jer. 11:20). Forgiving sins, also a prerogative of God alone, points to a theology of Atonement that is worked out in actions, not words, in Mark’s Gospel. Because “a person doing the sorts of things Jesus was doing, in not merely a Jewish environment but in a milieu in which a holiness reformation was in progress (led by the Pharisees), could reasonably expect a premature death,” this story is about more than the forgiveness of sins. Jesus is setting in motion a chain of events that he would know (even without inspiration) would lead to his own death; in a very real sense, Jesus is willingly trading his own life for the man’s wholeness. Comfort, New Testament Text and Translation Commentary, 99. Trinity Press International, 2002), 21. Witherington, Gospel of Mark, 115.
passages ( John 5:14) but is denied in others (Luke 13:1–5; John 9:2–3). Reading of Mark 2:1–12 in the Light of Psalm 103,” Ex Auditu 21 (2005): 74. This seems to be the sense in 3:28, but note that it is plural (“sons of men”) there. Paralytic,” Harvard Theological Review 47 (April 1954): 115–20. Oden and Hall, Mark, 29. Witherington, Gospel of Mark, 114.